Junior guard Kai Moon was seventh in the America East last season in both assists and steals. Image Credit: Jonathan Cohen. Junior guard Kai Moon was seventh in the America East last season in both assists and steals. Photography: Jonathan Cohen. It’s a new era for the Binghamton women’s basketball program but the goal is to build upon its most recent success. After going 20-12 last year and advancing to the second round of the WBI, the Bearcats graduated a pair of all-conference players and head coach Linda Cimino accepted a similar position at St. Francis (N.Y.) College. Enter Bethann Shapiro Ord as Binghamton’s new head coach. She arrives from Weber State, where from 2011-18 she rebuilt that program from the ground up. In the past three seasons, the Wildcats went 57-41 while playing in the Big Sky Conference and advanced to the WBI twice. Shapiro Ord now returns to her home state of New York and intends to take another step forward with the Bearcats. Shapiro Ord first met the team as a group during summer workouts in early July. Since then, she has seen the team improve both individually and collectively. Despite the transition at Binghamton, the America East preseason poll still has the Bearcats picked fifth in the conference. Furthermore, junior point guard Kai Moon was named to the America East preseason all-conference team. The respect from the rest of the conference is evident but there are keys to living up to the predictions. Moon was the Bearcats’ second-leading scoring last year (11.7 ppg.). In the conference rankings, she was fourth in free throw percentage (.815), seventh in assists (3.0 apg.) and tied for seventh in steals (1.8 spg.). After being named to the America East All-Rookie Team in 2017, she moved up to the third team last season. 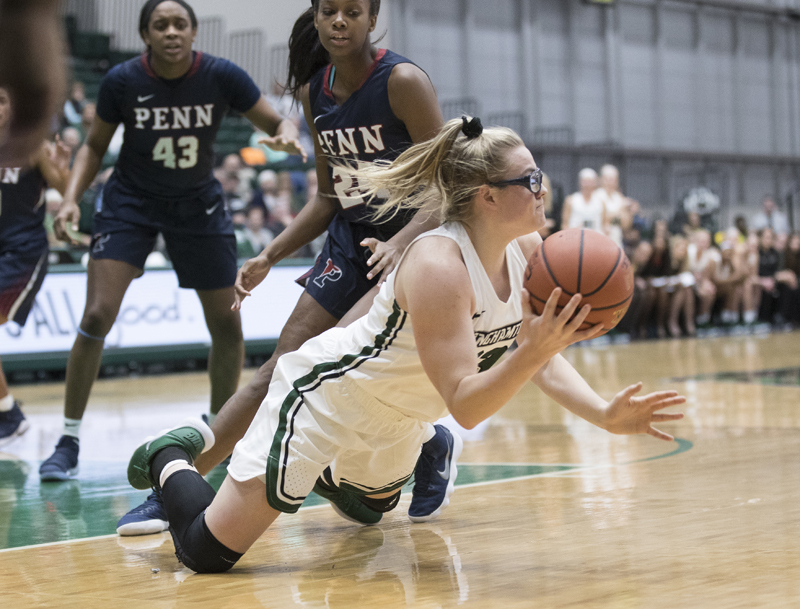 Senior forward and returning starter Rebecca Carmody was fifth in the America East in rebounding last season Image Credit: Jonathan Cohen. The Bearcats other returning starter is senior forward Rebecca Carmody. A versatile player who can start at a guard or forward position, she was the team’s fourth-leading scorer last year (7.4 ppg.). Carmody was also fifth in the America East in rebounding (6.8 rpg.) and tied for 10th in blocks (0.6 bpg.). After transferring last season from Georgetown and sitting out the 2017-18 season in accordance with NCAA rules, sophomore forward Olivia Ramil is ready to play in front of her hometown family and friends. A former standout at nearby Binghamton High School, she figures to make an immediate impact in the paint. Junior Carly Boland made 12 starts last year on the wing. Two seasons ago, she led the America East in three-point field goal percentage (.460). Last year, she tied for sixth in the America East in blocks (0.6 bpg.). Carmody is one of three fourth-year players on the team this year. She is joined by senior forward Kennedi Thompson and redshirt junior Corrinne Godshall. Although they have been reserves the past three years, both have become vital to the team chemistry. Junior Karlee Krchnavi is another versatile player who can play at the guard or forward positions. Redshirt sophomore Bailey Williams suffered a season-ending injury last year. She returns to the court this year as one of the team’s best free throw shooters. Sophomore Kaylee Wasco made eight starts last season at the forward position. She figures to be instrumental in paint this season. Fellow sophomore Lizzy Spindler was a reserve player last year but showed promise from beyond the arc. Against UMass Lowell, she drained four consecutive three-point field goal shots. Freshman forward Annie Ramil joins her sister Olivia on the Bearcat squad this year. Another former standout at Binghamton High School, she has already shown signs of growing into the college game. 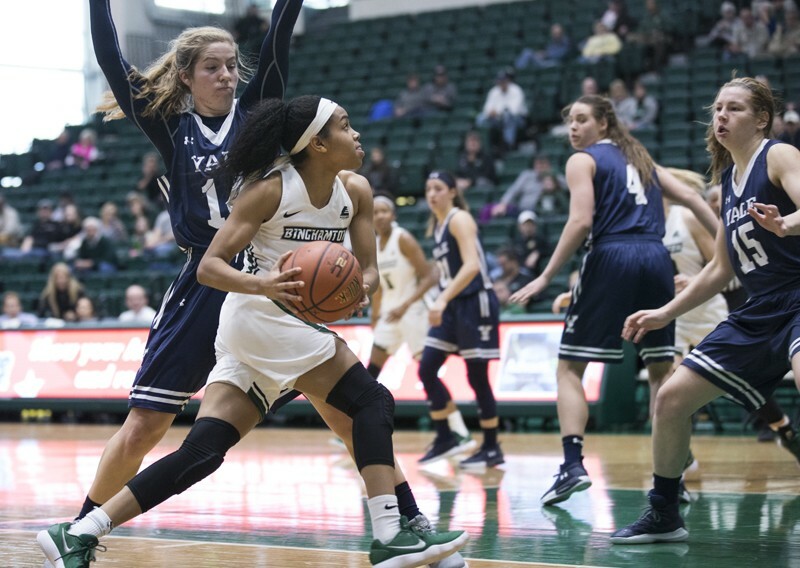 The Bearcats’ other newcomer is freshman guard Hayley Moore, who arrives from Marlboro, N.J. She became a proven shooter in high school, a role she is seeking to continue in college. Binghamton new era begins with a Nov. 6 home game against Charleston University. The 29-game regular-season slate also includes trips to Notre Dame and Marquette as well as home and away games against the other eight America East programs. The Bearcats’ contest at Notre Dame, which is scheduled for Dec. 16, marks the first time ever that they face the defending NCAA Division I champion. Marquette, who Binghamton travels to face the following day, tied for first in the Big East and advanced to the second round of the NCAA Tournament last spring. Following its season-opener against Charleston, Binghamton remains at home for a Nov. 9 game against Cornell. Other home non-conference games are against Caldwell (Nov. 18), Lehigh (Nov. 21), Army (Nov. 25), Fairleigh Dickinson (Nov. 30) and Rider (Dec. 8). Also on the road, the Bearcats have non-conference games at Lafayette (Nov. 11), Ohio (Nov. 15), Niagara (Dec. 5) and Dartmouth (Dec. 31). America East Conference play begins with back-to-back road games at Albany (Jan. 2) and New Hampshire. Binghamton then has three straight home dates against Stony Brook (Jan. 9), UMBC (Jan. 16) and Vermont (Jan. 19). Other conference home games against are against Hartford (Jan. 30), Albany (Feb. 2), New Hampshire (Feb. 9), UMass Lowell (Feb. 20) as well as the regular-season finale against Maine (March 2). On the road, Binghamton also heads to UMass Lowell (Jan. 23), Maine (Jan. 27), Stony Brook (Feb. 6), UMBC (Feb. 13), Vermont (Feb. 23) and Hartford (Feb. 27). For the first time in over 20 years, the America East Tournament will be taking place on campus sites with the higher seeded school hosting each game through the championship. The quarterfinal round takes place March 6, the semifinals are on March 10 and the title game is set for March 15.